Clean text, small archival-tape repair on title page spine seam, age discoloration inside covers and facing pages as well as on cover, moderate amount of edge wear and peel, spine straight and tight. "Lucian Pye, one of the most knowledgeable observers of China, unfolds in this book a deep psychological analysis of Chinese political culture. The dynamics of the Cultural Revolution, the behavior of the Red Guards, and the compulsions of Mao Tse-tung are among the important symptoms examined. 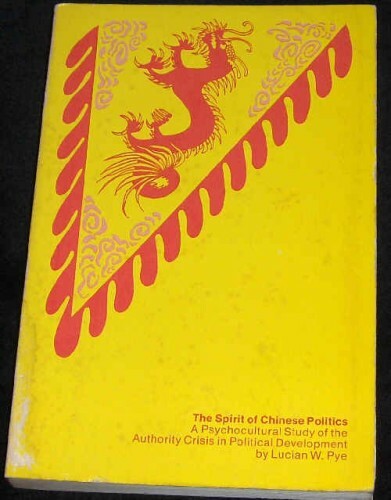 But Pye goes behind large events, exploring the more enduring aspects of Chinese culture and the stable elements of the national psychology as they have been manifested in traditional, Republican, and Communist periods. He also scans several possible paths of future development. The emphasis is on the roles long played by authority, order, hierarchy, and emotional quietism in Chinese political culture as shaped by the Confucian tradition and the institution of filial piety, and the resulting confusions brought about by the displacements of these traditions in the face of political change and modernization."